Well, I think Spring has finally arrived in the Chicago area, at least that is what the birds and my allergies have been telling me. It's a beautiful day today, and tomorrow is supposed to be even warmer. I was too lazy to make it out of bed this morning, but tomorrow I hope to get up early enough to scramble up to Illinois Beach State Park and do a bit of hiking and birding. In addition to the Henslow's Sparrow I worked on at the Field Museum this week, I was also given a number of Pine Grosbeaks that had been collected from the Minnesota Department of Natural Resources. Occasionally we will have birds that have come in from there, and it's usually something pretty interesting. Many times it is a species that is rare in these parts, or doesn't frequent at all. Aside from the odd sighting here and there, this is the case with Pinicola enucleator. Pine Grosbeaks are rather large finch-like birds that inhabit the pine and fir forests of the North. We are situated a wee bit too far south for their ideal range. In the winter time they can be found foraging in flocks for berries. They are often described as a rather slow moving, and sometimes surprisingly tame bird. There were about 6 grosbeaks that had come from the MDNR, and between myself, Andria, and a another volunteer we made study skins of them all. 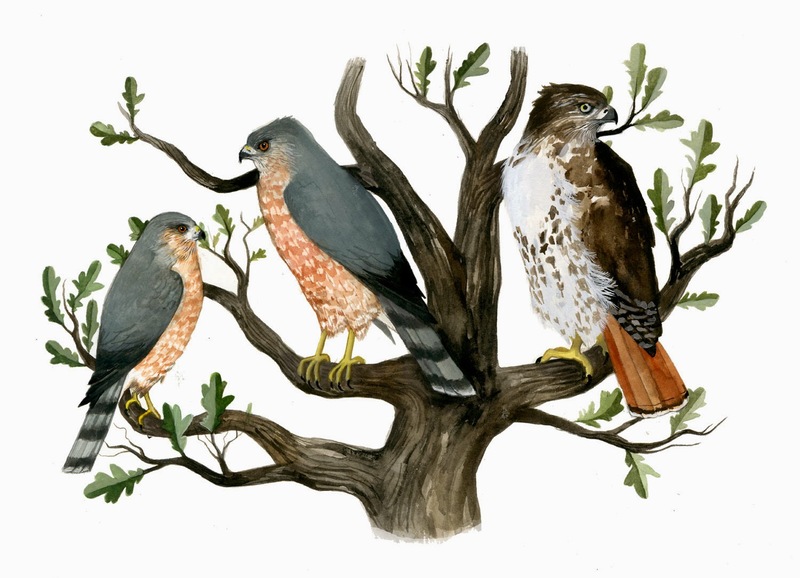 The coloring on each was gorgeous, but not typical of what I have seen depicted in bird guides. 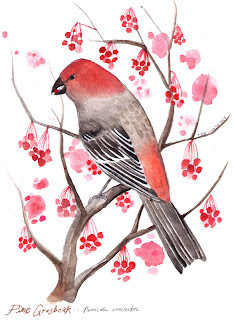 I have thought of the Pine Grosbeak as a having a more overall rosy plumage, but these were, for the most part, largely warm gray, with bright patches of russet on the head and rump. This plumage is more typical of the females, and many first year male and females. I recall that there was a pretty even mix of male and female in our batch, and most were probably window kills. Several of the specimens had broken leg and wing bones. I love the rosy colors.